This afternoon, I started reading a book that I’ve been wanting to read since before I even knew of it. For my entire life, I’ve been in a predominantly Baptist context. For the first 18 years of my life, much of my theology fell in line with mainstream Evangelicalism. As a young teen, I eagerly soaked up what I could only consider the “gospel truth on the End Times”. You guys know it as the Left Behind series. Sure, I knew that Tim Lahaye hadn’t personally seen a vision of all the details of the Rapture, Tribulation, and Second Coming, but I knew he had to be pretty darn close. As I entered college and started work at our local Christian bookstore, I began to learn about all those other “wrong perspectives” in the Christian world. One of the books I read during college was “Irresistible Revolution” by Shane Claiborne. This book really gave me a vision for how the Church could go about being the body of Christ within the world and living as the Kingdom NOW. As I took in all of these new ideas, read still more books from unfamiliar perspectives, and discussed these with friends and mentors it seemed as if the way God designed the church simply wasn’t compatible with the End Times theology that I had always accepted as truth. Followers of Christ aren’t looking to escape, they are supposed to be living the Kingdom here and now in a way that is counter-cultural. As the Church fulfills the mission of Christ, the world will still be broken, but we should not be withdrawing from it. We should be changing it from the inside out. If Christ has set about to restore all things, why are we so convinced that He won’t start doing it until the end? It seemed as if my understanding of how the Church was to fulfill Christ’s mission and how it was all going to end were simply incompatible. And over the last few years, I’m looked for a book that addresses this inconsistency. No one seemed to be speaking about what Christ restoring the world would look like apart from sensationalist fiction and fatalistic prophecy books. All of the authors and voices within the Church that had shaped my theology of LIVING seemed to be silent on the theology of end times. I started reading NT Wright last year when I wanted to understand the debate between him and John Piper over the doctrine of justification. Then, my small group spent the better part of 8 months studying the book of Romans as led by NT Wright’s study guide. My first impression of NT Wright was that he was a brilliant thinker and writer who really put the entire Bible (especially those pesky Old Testament parts) in perspective under the umbrella of Jesus. He really gave me a fresh understanding of Scripture and sparked in me a desire to learn more. A coworker loaned me a copy of Simply Christian and I consumed it happily. In a way, it was a modern-day Mere Christianity, but so much more big picture. After finishing the study of Romans and reading Simply Christian, I was talking with a customer recently who also greatly enjoyed NT Wright. We were talking about theology and he, a pastor, mentioned how much NT Wright had opened his eyes to reading the Bible in a fresh light. He also mentioned how his End Times Theology had deeply been impacted. With this, I was floored. 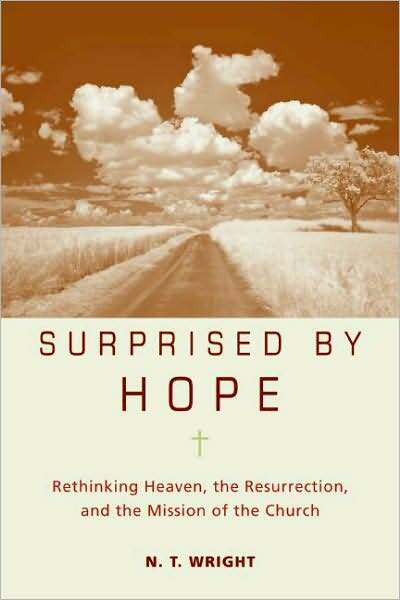 I asked him what it was that helped him come to some clarity, and he said it was NT Wright’s follow-up to Simply Christian, titled Surprised by Hope. Now, I finally had a tangible starting point to finally coming to my own clarity on how a theology of Christ’s Second Coming and New Creation relates to how I live NOW and how I work within the Church to live out the Kingdom. The past few weeks since that conversation have been busy, and I’d been trying to find a way to get my hands on a copy of Surprised By Hope. Today, during my lunch break I finally began reading this book. I’m only a chapter into it, but already I can tell that this is the book I’ve been waiting years to read. I plan to post more of my thoughts in a much more detailed post. I haven’t decided yet if I’ll be doing this every few chapters or after I’ve finished the book, but I am excited to learn and grow from it. Have you read this book, (or anything by NT Wright)? What were your thoughts on it or his writing? I was thinking about the title of my blog today. Titles are important, you know. They’re supposed to be unique, creative, yet still sum up what you are intending to create and present. When I stopped to decide if I really wanted this to be my blog title and URL, all I could think about was tetherball and Napoleon Dynamite. 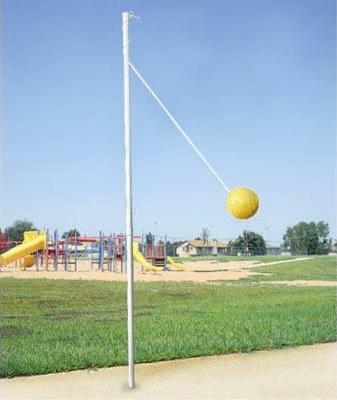 My soul was the bright yellow ball and I was forever connected to Christ by a thin rope. I admitted this image seemed sort of ridiculous, but the title still “felt right”. As I backspaced out “tetheredsoul” and tried a few other options, I couldn’t seem to shake that first title out of my head. Oh to grace how great a debtor daily I’m constrained to be. Here’s my heart, Oh take and seal it, seal it for thy courts above. This verse has always resonated strongly with me. I think it portrays a beautiful picture of the grace that God has for us even as we wander, doubt, and question. In my life, there are definite times that I struggle with God. There are times that I wrestle with His truth and the world in which I find myself. There are times when I’m frustrated that I’m having to live in uncertainty. I get anxious and restless. There are also times of rest and pure joy as I throw myself down at His feet admitting that I don’t have all the answers.